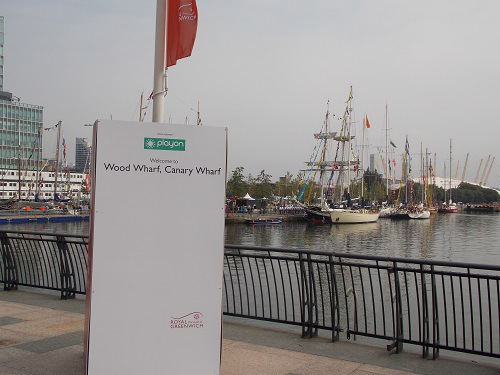 It is that time of the year when people begin to review the past 12 months, carrying on the tradition from last year I am listing the ships that have visited West India Docks. 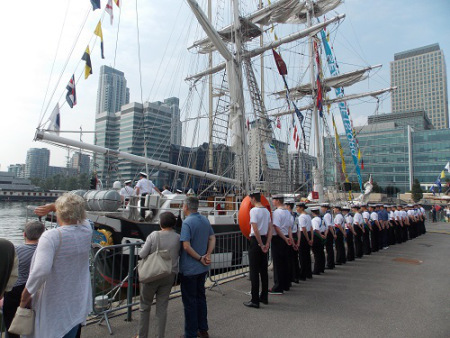 In a very eventful year, the highlight must be the Tall Ships Festival, the largest gathering of Tall Ships in London for 25 years was a spectacle few are likely to forget. Some old Tall Ships favourites returned, the Stad Amsterdam, Stavros S Niarchos and STS Tenacious but sad to see the final appearance of the TS Royalist. 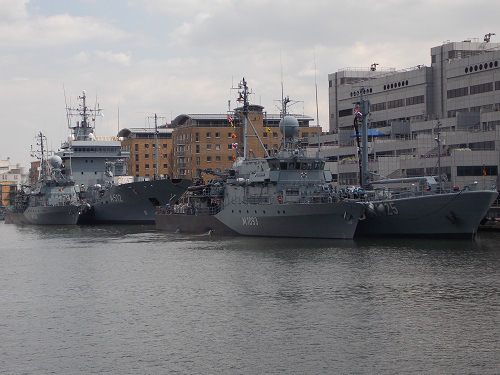 The Royal Navy and other nations ships visited quite regularly and there was plenty of excitement when a small German flotilla appeared and then later a NATO Flotilla came into the dock. A number of Super Yachts docked, giving a glimpse of the world of the super rich. 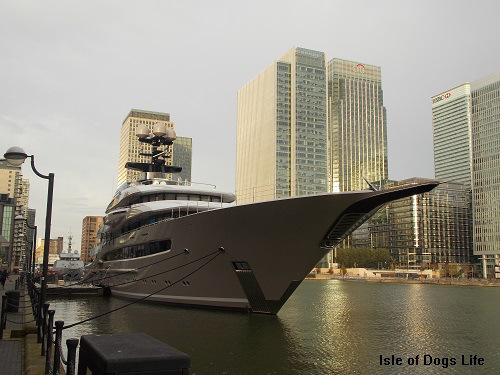 Often beautifully designed, they do seem well at home amongst the Canary Wharf skyscrapers. 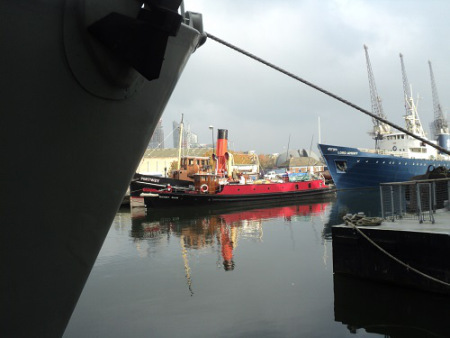 At the other end of the scale, the Lord Amory and the restoration of the Massey Shaw and Portwey continues which add interest to the dock all year round. the Latvian Navy’s LVNS Talialdis and the Dutch Navy’s HNLMS Zierlkzee. 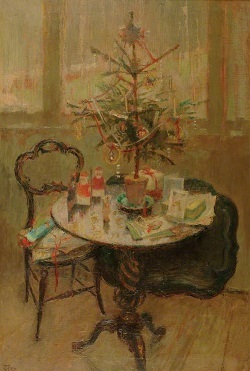 It is a little tradition on the website that in the week before Christmas Day I publish a post that shows how artists have captured the Christmas spirit. A couple of the pictures show the effects of the First World War which is perhaps fitting considering it is the centenary of the beginning of the conflict. 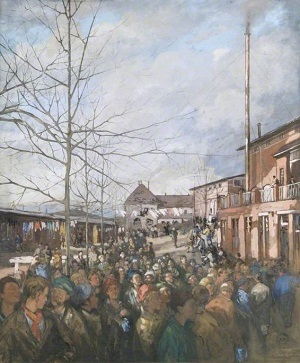 The criteria I use in selection is that the subject matter involves London or the painting is available to see in London. 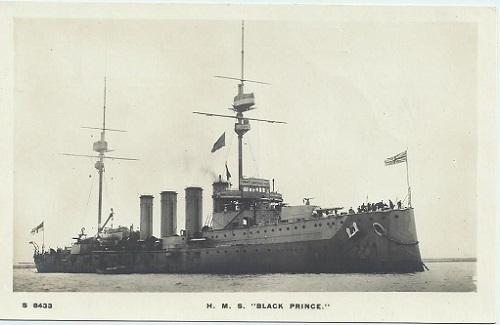 Eric Pemberton has always provided the site with a number of fascinating postcards, a few weeks ago he sent a postcard of the locally built HMS Black Prince and some of the ship’s history. The HMS Black Prince was a Duke of Edinburgh-class armoured cruiser built by the famous Thames Ironworks in Blackwall and launched on 8 November 1904. The ship was one of the last Royal Navy ships built-in the shipyard which was at the time facing considerable financial problems. 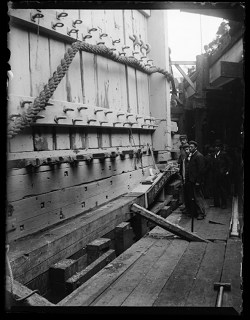 An unusual photograph entitled ‘Launch of the ‘Black Prince’, Thames Ironworks’, taken by Edgar Tarry Adams in 1904. 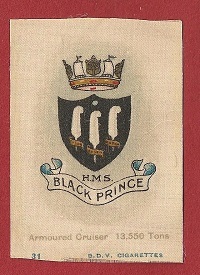 The HMS Black Prince served with the 2nd Squadron until 1907, the 1st Cruiser Squadron from 1907–1908, the 5th Cruiser Squadron (as part of the Atlantic Fleet) from 1908–1912 and the Third from 1912–1913. 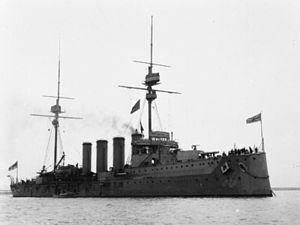 The ship was stationed in the Mediterranean when the First World War began and became involved in the pursuit of the German battle cruisers, Goeben and Breslau. 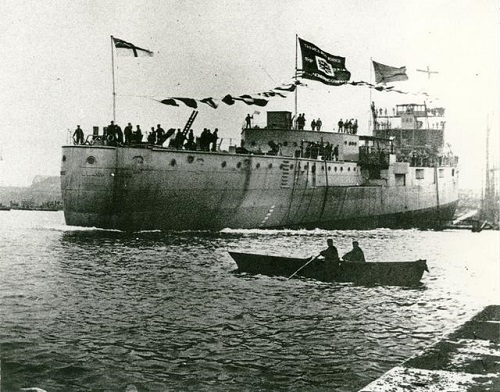 The German ships reached safe waters, so the ship was sent to the Red Sea to protect troop convoys arriving from India and to search for German merchant ships. After capturing two German ocean liners Südmark and Istria, Black Prince was transferred to the Grand Fleet. However it is the ship’s involvement at the Battle of Jutland in 1916 that would concern historians for many years afterwards. In the process of the battle, the ship lost contact with the rest of the fleet and was sunk with all hands lost. The only clue to the ship’s demise was a wireless signal received at 20:45, reporting a submarine sighting, this led to rumours that the ship had been sank by a submarine . Eyewitness reports seemed to offer contradictory evidence. An officers report of the battle offers some reasons for the confusion. The fact there was no survivors from Black Prince’s crew, all 857 being killed might indicate that the ship blew up almost instantaneously which did not give a chance for anyone to survive. However it still remains one of the great naval mysteries of World War One. In Lorraine’s latest memories, she remembers how people helped each other out, the deliveries of beer by horse and cart ,the Irish community and how visiting the local cinema left her starstruck and dreaming of stardom. The Isle Of Dogs was made up of many nationalities and religions. People helped each other and if the man of the house was sick and could not work, or when the mother was ill and the children needed care, everyone mucked in and no family was left in trouble. If a man was very drunk and violent there would be men from other families who would go and ‘sort him out’. It was a close-knit community and looking back I feel privileged to have been a part of that life and have had the opportunity to experience the spirit that existed in the East End at that time. It made me grow up understanding what poverty and social inequality does to people and how unfair life can be for some. Around Easter time, Irish Catholics would make a display of Jesus and Mary with candles and flowers in the windows of an upstairs room. The displays would be draped with lace and the windows looked like beautiful framed pictures. The Priest walked around the streets and blessed the houses, swinging a container of sweet-smelling incense. Some of the children would follow the priest from street to street, stopping to look at the wonderful window displays, which were lit up like fairy grottos. Well, as I imagined a fairy grotto would look. It was all very exiting. 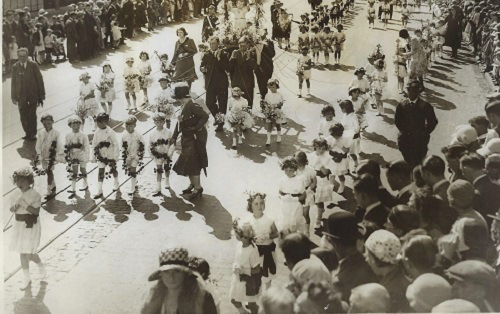 When Good Friday came around a couple of the older girls would take a big thick barge rope, extend it from one side of the road to the other and use it as a skipping rope. The grown-up married women would take it in turns to hold the rope, as it was very heavy. Everyone would be expected to jump in as the rope was turning. This would go on along all the streets, not just ours, and it was a sight to behold with all the mothers and aunts jumping in and having their turn. I was about eight when we came to live in Stebondale Street on the Island. Recently, I read in one of the Island Trust magazines that Stebondale was one of the island’s worst hit streets during the war. Every day brought a new scene for us. 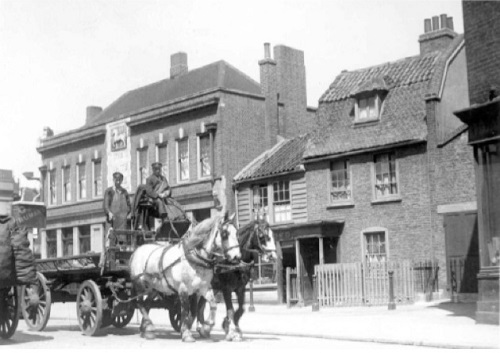 Beautiful draught horses hauled heavy barrels of beer from Whitbread’s Brewery. You could not help but stare in wonder at these beautiful animals, which were always so well-groomed and handsome. Tall horses with enormous hooves and drays reaching high up into the air, so high we had to lift our heads to see the drivers. The drays were always driven by big, strong men who wore leather aprons and sat proudly holding the reins, guiding their charges. The horses had big leather halters round their necks and their manes were plaited and knotted with coloured ribbon. The leather straps around their necks were covered with ornamental brass emblems. These horse brasses are now bought by people to display in their homes. The originals are very collectible and it must be something to hold an authentic brass knowing that at one time a beautiful draught horse wore it proudly, and its owner polished it with pride. Our street was paved with cobblestones when we first came to live there, and I loved to listen to the sound of horses hooves on them and see such large animals trotting so gracefully while carrying such heavy loads. Sometimes they would leave droppings on the road and it was commonplace to see someone rushing with a bucket and shovel to collect them. This was not to make the road clean but for the manure to use on their allotment. Sadly these horses are no longer seen on the streets of the East End, and are only seen on special occasions like the Great British Beer Festival at Earls Court. These wonderful scenes that were free for me to enjoy as a child now live only in my memory. How I would love my children and grandchildren to share these pictures. I hope that through my writing I will be able to conjure up the scenes of my childhood for them. Sometimes buskers, hoping to earn a bob or two, would walk in the road dressed up and playing an instrument to entertain us. I remember my Mum’s reaction when two men dressed as women came along one day. “They are Aunt Sallies,” she said, “Don’t look at them. Come indoors!” I never knew why she said this and still don’t know to this day. I asked my Aunt Con about it one day and she said my Grandma used to say the same thing to her, but she never knew what she meant by it either. I used to love to entertain the local children. They would sit on the pavement and I would dress up, dance and sing for them. I loved the films and grew up with Fred Astaire, Ginger Rogers and all the wonderful Ziegfeld showgirls who could be seen at the cinema in those days. 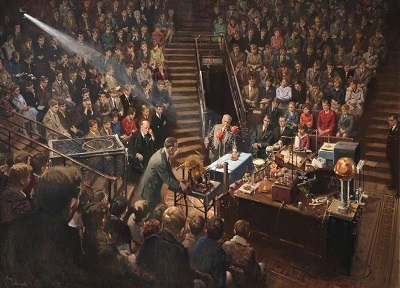 You would see the main picture, then a B-Movie and during the interval an enormous Wurlitzer electric organ would rise up slowly from below the stage. The organ was white and glowed with multi-coloured lights and the organist wore a white suit. With a microphone beside him he would announce the songs he would play. The organist would end with his signature tune and wave. As the organ slowly descended back down below the stage you could hear the music slowly fading. 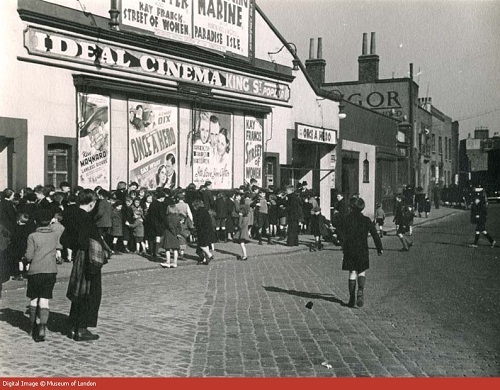 Outings to the cinema with Mum and Dad in those days were wonderful. Some people would move over to the shorter queue and would stand in front of the sign that read ‘one shilling and sixpence’, but often for our family of six the difference was too much and we would all go home feeling disappointed. After watching a show I would be full of thoughts of how much I would love to be an entertainer like the organist or a film star and dream of all the wonderful things I could do. At ten years of age everything seemed possible and that is the way I used to think. The world was my oyster, I told myself; all I had to do was to grow up. But I was not grown-up yet and the next best thing I could do was pretend to be and entertain my friends. 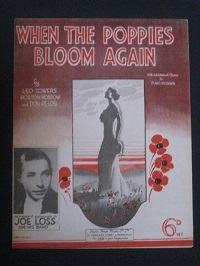 So, I’d sing When the Poppies Bloom Again at the top of my voice, wearing my red tap shoes with some old lace curtains draped around me. I would dance and sing thinking I was Ginger Rogers or Judy Garland and the children would sit on the cold pavement to watch me. Star struck is what I was, but I was not alone, as a lot of little girls felt the same way. This was a time when film stars dressed beautifully and wouldn’t be seen unless they were made-up and wearing the very latest fashions. Photos would show them smiling, looking glamorous, with beautiful furs draped around them and jewellery worn to excess. This was the way it was, fashion from head-to-toe: hats, matching gloves, handbags, shoes, and hair never out of place. 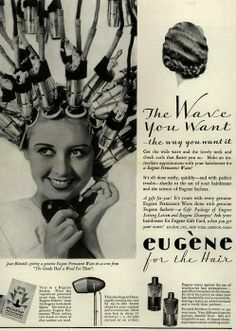 This was also the time of the Eugene permanent wave machine, fabulous furs, powder puffs, compacts, cigarette holders and silk stockings. Nylon had not been invented then and it was pure silk stockings for those who could afford them or lisle stockings for those who had to make them last. People tried to present themselves with a good image and I loved to see my good-looking, tall mother dressed-up smart, and looking like a film star. Of course, how you dressed made an impression in those days, and it is a sad reflection to know that the poor were already being stigmatised by what they wore. Mum was very conscious of cleanliness and I can recall the day when she called me to the window, then, with an air of secrecy, opened the curtain and told me to look out. “See that man selling the candy floss. Well you watch him. See how he has just licked his fingers and is now touching the floss which he is selling to that child. Can you understand why I do not want you to buy that stuff from him?” That picture was worth more than a thousand words to me. Mum was clever; I knew that. I dare not think what she would have said if she had found out about the locust we ate off the ground. Lorraine at nineteen was a Lucy Clayton Trained Model and modelled in many of London’s top fashion houses. In 1949, she married a Doctor of Medicine who later became a Consultant Psychiatrist. and had a daughter and two sons, and is now a grandmother to nine grandchildren. In 1979 she left England and with her second husband and moved to New Zealand and opened a number of beauty salons and her own Beauty Therapy Training College. Lorraine also began to write her own regular page on beauty in The NZ Headway Magazine. In 1987 she and her husband retired and moved to Australia where she developed her creative skills becoming an artist, ceramicist, sculptor, poet and a published author. Now the cold weather has arrived, the Island is exposed to the cold gusts of wind off the river. However for all the discomfort of the present, it is nothing compared with some of the major problems of the past. 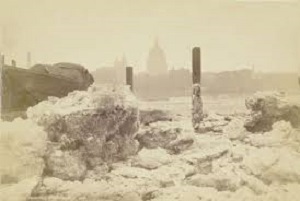 The Great Freeze of 1895 is a prime example . 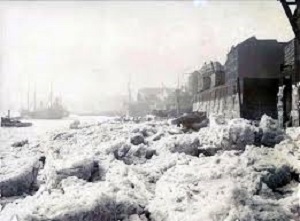 Recently I came across the above picture of a frozen Limehouse in 1895, it seems quite picturesque to the modern viewer but the arctic conditions had tragic consequences to many people especially in the East End. Newspapers of the time were quick to point out that the cold spell was causing serious problems. London, February 12. There is no abatement of the abnormally cold weather which has prevailed in northern Europe for the last week. 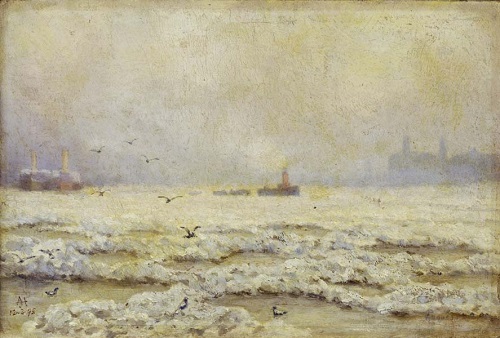 The Upper Thames is frozen over, and huge blocks of ice breaking away from the mass are floating down, the river, causing much damage to the smaller shipping craft. Water traffic is consequently at a complete standstill. Many cases of death from cold and exposure are reported, the privation and distress in the east end of the city being particularly severe. The cold is so intense that birds are found frozen to death on the branches of the trees, and thousands are perishing. The severe weather has also directly caused considerable mortality, a number of deaths from exposure having been reported among postmen, omnibus drivers, cabmen, and labourers. The cold weather stopped workers from working in the docks where ships were frozen in. If the worker did not work they did not get paid and the arctic conditions lasted so long, people were so desperate they turned to charities for help. Another newspaper visited a Salvation army in Whitechapel. The Salvation Army food depot in Whitechapel Road, for instance, is crowded, mostly by women and children, in the afternoon. Practically all these women are working women, charwomen and so on said Commissioner Cadman, and the frost has deprived them of their work. They come here to get a half-penny or a penny meaL and we let them. 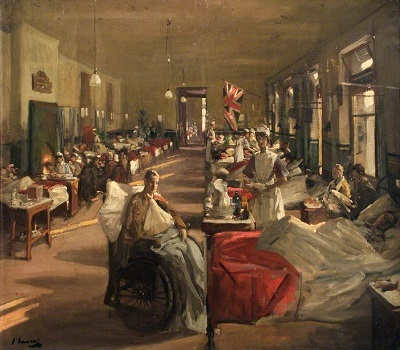 That single picture in the Salvation hostel brought home most vividly the struggle for sheer existence which is going on but some figures which Mr Wynne Baxter, the coroner for East London, put at the disposal of a member of the Chronicle staff, indicate that many are falling in the struggle. 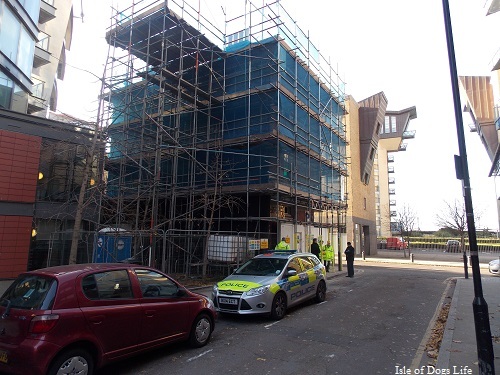 His district covers that bleak portion of the metropolis running from Poplar up through Stepney, Wapping, Bow, and St George in the-East to WhitechapeL Last week he attended about sixty inquests, while in the same week last year the number was only thirty-two. The only meaning to be put on this tremendous contrast is that the frost is responsible for the doubling of the death-rate. In the coroners’ districts for North-east London and North London the number of inquests has also gone up almost as alarmingly. Have people died directly and simply from cold ? it may be asked. Many cases might be given as a melancholy answer to it, but two that have come under Mr Wynne Baxter’s attention daring the past few days may suffice. An old woman living in St. George’s- in-the- East went out in the morning to fetch some perquisites, bundles of waste paper or something else was in the habit of getting. She was found, not having got very far, seated in the street, where the cold had killed her. Perhaps that is putting the tragedy in fewer words than a medical man would, but they really represent what happened. Another old woman was found dead in bed — such a bed ! — in a two roomed house in Poplar, where she and her husband lived. She had been suffering from bronchitis, and he was lying ill in the other room. Neither room had a fireplace, and the door of one opened directly into the street. She was killed by the cold without question, and how could it be otherwise ? Such reading is not pleasant, but it is good for us all to know what is happening. 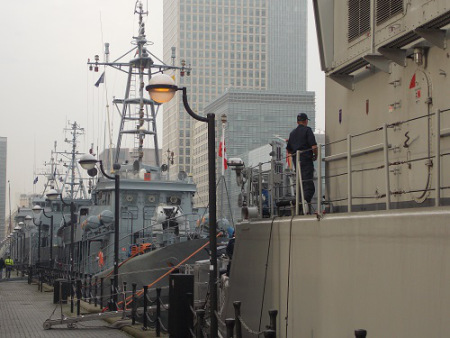 Even fighting a fire in the London Docks was made almost impossible by the conditions. During the late frost, after attending a fire at the London Docks, involving the-loss of some £60,000 or £80,000, those of the firemen who proceeded homeward, at 9 o’clock in the morning, along Commercial Road, presented a most remarkable appearance. In a large number of cases their helmets were frozen to their heads, and icicles nearly six inches in length hung from them and also from the men’s coats; This, however, was not surprising, considering the circumstances in which they had carried on their arduous labours. So intense was the cold, indeed, that when an engine stopped working for a few moments the water froze in the hose. As the water was thrown out of the nozzles the ice formed round the end of the metal until there were complete rings of ice several inches long on the end of the nozzles, through which the water passed. When two men held the same ‘ branch ‘ they froze together as they stood, and yet close to the fire the heat was so intense, that it was impossible to face it for any length of time. The water as it ran out on to the ground froze instantly, and the firemen soon became completely encased in sheets of ice, which froze on their uniforms, hair, and beards. The ladders became perfect pictures, being covered with long lines of ice. The ruins of the fire presented a most picturesque appearance. Enormous icicles were hanging from the roofs, while the walls were entirely covered with a pure white frost. The hanging cranes and lamp-posts had been converted into pillars of ice, which, however, were a constant source of danger to the men employed near the scene, owing to the liability of the ice to break away and fall in large quantities. 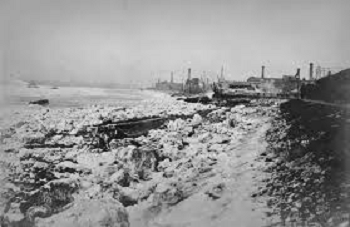 The telegraph and telephone wires which led into the ruined warehouses, but which were broken down, were also covered with thick ice and frost. It was not just Britain that suffered, the United States and Eastern Europe were badly affected. Eventually things got back to normal but the full cost both in human lives and deprivation will never be known. 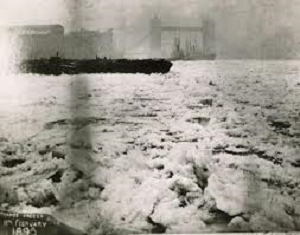 Extremely cold winters have caused havoc since 1895, but the scenes of massive ice floes on the Thames have never really been repeated. 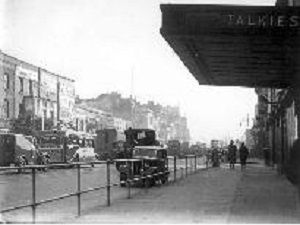 In the second part of Lorraine’s memories of the 1930s on the Island, she writes about the joys of visiting Greenwich and Blackheath Fair. Closer to home she describes how children made their own entertainment and remembers visits from a couple of street sellers. Greenwich is of course famous all over the world Greenwich Meridian, Greenwich Mean Time and the fact that Queen Elizabeth I resided there. I remember Greenwich Park and the worn brass handles that gave a measure of some sort, but I can’t remember what it represented. I only know we always tried to stretch our arms to cover the space. I bet the brass handles are still there. 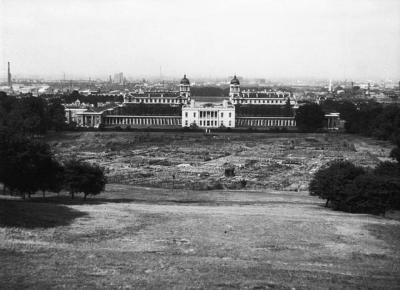 Not far from Greenwich is Blackheath, which was a very special place on account of the big fair that took place once a year. In those days you could win really big prizes. We would leave home when it was dark and the fair would be lit up like fairyland. Mum and Dad would give us sixpence to spend, which was a lot of money. This was a special treat and we were able to afford lots of rides and goes on the glass cabinets with little electric cranes inside them. We would try to manoeuvre the cranes and pick up one of the gleaming prizes that lay amongst the jellybeans. It was all a matter of skill, but we were never lucky. Mum and Dad would join us on the rides. They had married in their teens and were still very young and enjoyed the fair as much as we did. It was good to see them happy, as I knew it was hard sometimes for Dad to provide for us all. Women stayed home and looked after the house and family in those days, so there was only one breadwinner and there were times when life could be hard. Fairs such as those I knew as a child do not seem to be around any more and those today do not offer the big prizes that were there years ago. A plastic toy of little worth will not make a child’s eyes light up as ours did. 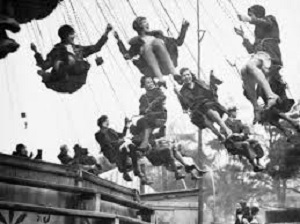 It is very sad that children today have no knowledge of the wonderful fairs of bygone days which gave such pleasure to many children who lived dull and drab lives. Many children lived with fathers who came home drunk, spending more on drink than they gave their wives to live on. They would cause havoc and violence in the home and produce baby after baby which they could not afford to keep. 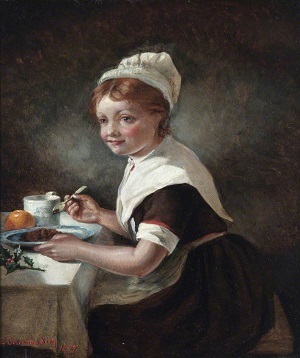 Older children were often forced to live out their childhoods as drudges, cleaning and helping the poor mothers look after the little ones, sometimes having to miss school if their mother became sick. 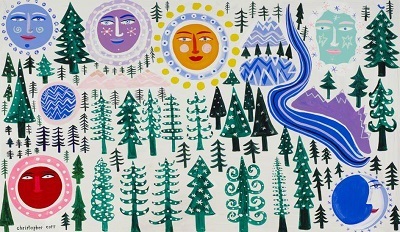 For many children a lively imagination was the only way they could add colour to their lives. I believe that it is due to the use of the imagination that the East End of London produced so many well-known writers and theatre personalities. Our house was a rented, double-fronted shop. The living area was behind the shop and the bedrooms were upstairs. There was no bathroom; you washed in the kitchen and bathed in a galvanised bathtub on a Friday night. There was an outside toilet and yard and at the bottom of the yard was a fence. 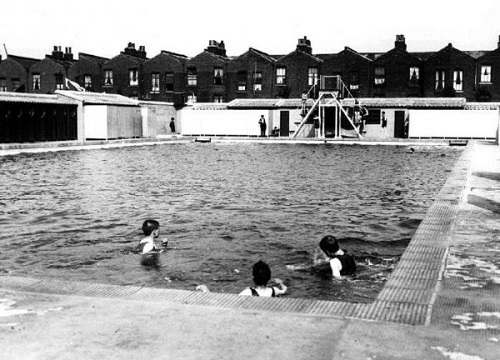 When older, many went to the local public baths where you paid and would be given a towel. You were allowed a certain amount of time and if you overstate, the attendant would knock on the door and shout “Get out!” and you would rush and dry quickly. The bottom of our garden looked onto a park , and what a park it was. There was a recreation ground for football, a big open-air swimming pool, a playground with swings, slides, roundabouts and a sandpit. In another area were tennis courts and a big grass area where girls would dress up and play May Queen on May Day and have picnics after school. In the summer holidays we would play out all day long. We never thought about being in danger as children do today, and so we kept our childish innocence a little longer. Of course, we were told not to speak to strangers; this was drummed into us regularly. On cold winter nights, friends would play ‘I Spy’, looking in the shop windows near us. We lived in the middle of a row of six shops. At the corner, near the entrance to the park was Mrs Kirk’s shop. 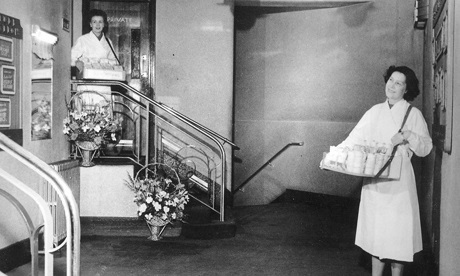 This was our shop for sweets and groceries, although she never sold the unsalted butter Mum liked and I used to go to a shop further along our street to get that. Every season had its games. Whipping top, hopscotch, marbles, roller skates, cigarette card swapping, hula-hoop, yoyos and too many more to mention. I cannot remember any child ever saying they were bored. There was a pub on the corner of the other side of the park entrance and I used to love to lie in my bed and listen to people singing on a Saturday night on their way home after the pub had closed. They would sing the songs Mum and Dad sung with us on a Sunday evening. Some would be drunk, and they all sounded happy. My parents never went to the pub, but would have a drink at home with friends or family when it was a special occasion. They used to think it was shocking to see children outside the pub while their Mums and Dads were inside drinking. This was a part of East End life, and one that many children grew up with and accepted. So long as they had a packet of crisps and lemonade while they waited, they didn’t seem to care. With my bedroom facing the street, I felt comforted by the light of the buses as they passed our house. Their headlights would move across the room as the bus went by. Because I was afraid of the dark I would imagine all sorts of horrible creatures lurking in my bedroom. The bus passing would comfort me and make me feel less frightened. 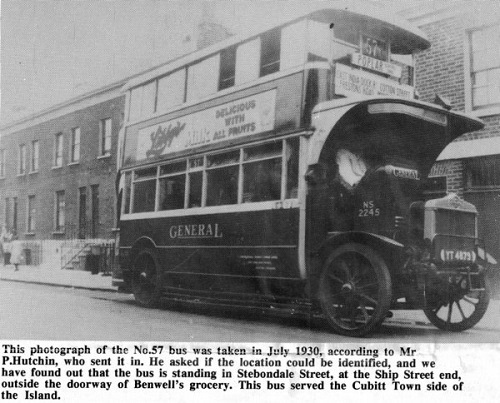 I would lie awake and when the last bus had gone all would be still and quiet. My brothers would have been asleep for ages and I would hear Mum and Dad come upstairs. They always kissed each other goodnight, which I could hear, after which I knew I was all alone. Some nights a mist would cover the area and the boats would sound their foghorns, which made the atmosphere even more eerie. I would lie awake and sometimes morning would arrive and I had not slept, or so it seemed at the time. I never told Mum about this, but it was a very bad time for me. Some nights the toffee apple man would come round the streets, always walking in the middle of the road with his barrow. We would hear him call “Two a penny toffee apples”, just after we children were tucked up in bed. Mum would get cross when we would call out, “Can we have a toffee apple please Mum?” “No! You can’t. It’s not good for your teeth,” was her usual reply, although she did surprise us a few times and brought one up to us. His call was so loud we couldn’t miss him, but why did he have to come so late we wondered? At times during the holidays a man would come round the streets with a horse and cart. It was only a little horse and on top of the cart he had a roundabout which was also small. It could fit eight children squashed together on the little seats. We had to climb up a little wooden ladder to sit on the seats while he turned the roundabout with his hand and we would go. The ride did not last very long but we all loved it. An empty jam jar was the price for a ride and we would rush to get as many jars as we could from relatives and neighbours before he moved further down the street. I often wondered why he wanted the empty jars but I never asked and so I never found out. 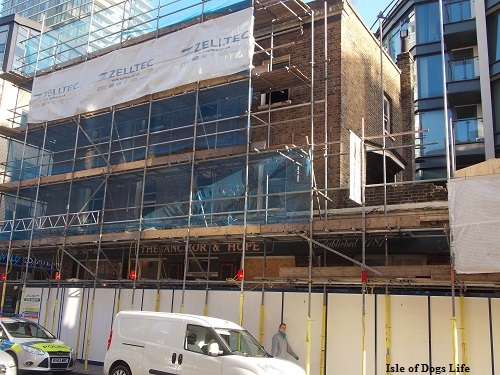 Regular readers will know that in the Isle of Dogs, many of the old pubs on the Island are facing demolition. 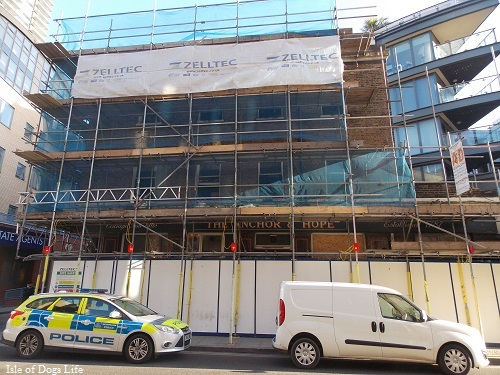 Having noticed that the Anchor and Hope on Westferry Road was being prepared to be demolished, I wandered down to get a few photographs this morning to be faced with a greater tragedy than the pub being demolished. According to Police reports there was an accident involving a collapsing wall, shortly before 9am. Paramedics were called to the scene but a man, in his 30s, was pronounced dead , 20 minutes later. 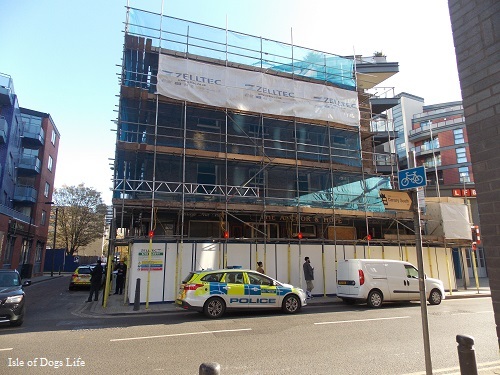 The Isle of Dogs is full of building sites and this accident and other recent accidents in London are a grim reminder they can be very dangerous places.